Ian Ellis explains how innovations in building technology will change the way consumers experience healthcare in the future. With energy efficiency targets to consider and wellbeing initiatives in place, construction of buildings and their ongoing management is becoming more and more complex. The importance of all these factors is perhaps no higher than in the healthcare industry, where smart hospitals can become part of the healing process. Apart from some very particular circumstances (like the birth of a baby) nobody wants to go to hospital. But unless you are extremely lucky a hospital visit is perhaps inevitable for us all at some stage in our lives - and we want our stay to be as comfortable and enjoyable as possible. Patients today are more informed and involved in their healthcare decisions. Gone are the days when they had limited expectations for the services and products they received from the healthcare industry. Patients are unlikely to return to a poorly maintained hospital and may even share their poor opinion with others. Similarly, a poor working environment might make it difficult to retain qualified hospital staff, who also need to be happy and comfortable, which is far from easy in what can be a highly demanding and stressful working environment. The technology we have available to us now can give us the tools to produce highly efficient medical facilities that can help in easing the pressure on hospital staff and create a perfect environment for patients during their visit. It is unfathomable to think now but there was a time when smoking was permitted in hospitals, whereas now there are calls from it to be banned from hospital grounds completely. Patients’ entertainment was limited to whatever newspapers, magazines or books visitors brought in for them. A shared television for one ward became fairly commonplace, and many hospitals still boast an in-house radio station through which patients can make song requests or have messages from well-wishers read out to them. In recent years, technology has given patients access to many more services. As crucial as bedside entertainment systems are in maintaining a patient’s morale, patients perceive the built environment of the hospital a supportive environment having direct impact on them and their families. Researchers suggest that patient attitudes toward and perceptions of the built environment of hospital facilities are based on whether the hospital provides a welcoming space for them and their visitors that promotes health and wellbeing*. Patients are able to operate the light in their room as quickly and easily as the air conditioning, the shading or the multimedia entertainment systems, which allow video on demand, watching television or surfing the internet. The hospital building is also becoming an increasingly important part of the care delivery process by contributing to the hospital workflows. Technology helps support the nursing staff so they can focus on their most important task: taking care of patients. 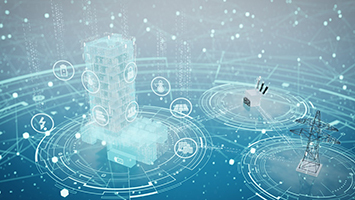 Advanced building management systems (BMS) and building information modelling (BIM) are two critical elements that are helping hospitals in their digital transformation journey. BIM process helps monitor and analyse all the aspects of the physical building in a digital environment. BIM also offers significant value in the operating and maintenance of a hospital and continues to contribute to efficiency, effectiveness, and economy throughout the life of the hospital building. Keeping vulnerable patients safe is just as important as keeping them comfortable. Because hospitals are open 24/7, they need comprehensive, customised security concepts. Whether it’s aggressive patient behaviour, patient falls, fire safety, infection, or other threats that jeopardise the safety of patients and staff, digital solutions can provide all the necessary safeguards. Operating rooms have one of the highest concentrations of devices in the hospital. This means that they're also energy-intensive. They also require constant heat, ventilation, air-conditioning and lighting to provide surgeons with optimal work conditions. When not in use, they offer significant savings potential. Unoccupied operating rooms are often provided with full ventilation even though it isn't necessary. Although constant ventilation is mandatory, it doesn't have to be at the same rate as during an operation. The operating room needs to remain under positive air pressure to prevent germs from penetrating from the outside, minimising the risk of infection. During an operation, laminar airflow around the table protects sterile zones from contamination. With an operating room management system, surgeons have the ideal tool for creating an optimal work environment. They can store their individual settings for a variety of operations, and these pre-defined scenarios increase patient safety and create perfect operating conditions for the surgeon. The HVAC, lighting, humidity, sanitation and power supply can all be customised, while the access control system prevents unauthorised access, which ensures that patients aren’t exposed to increased risk of infection. In addition to patient wellbeing, digitalisation can also improve staff productivity. In healthcare facilities, considerable time can be wasted searching for equipment, and theft is a huge problem and cost factor. Patient and asset tracking solutions are the perfect answer to address these issues. Real-time location systems (RTLS) not only improve the experience of care providers, patients and visitors, but also address the cost pressures by tackling productivity, theft, asset management and resource availability. As well as staff and patients, hospitals also have to consider visitors and outpatients who may be unfamiliar with the building. Healthcare facilities are often large and complex buildings that are challenging to navigate. Digitalisation allows facilities to provide user-friendly ways of navigating a facility via smart devices – from the parking garage directly to the bedside or treatment area. This ensures that patients and visitors know the best way to get to their destination, even when they do not speak the local language or have a medical impairment. Like all large digitalised facilities, the data that is made available from a hospital’s BMS has a tremendous potential value in enabling optimisation. This applies not only to the direct interaction of building users within the building, but also to a longer-term analysis of the performance of the building. In the previous decade, the performance of buildings was mostly viewed from an energy consumption perspective. Digitalisation will expand that into other areas such as room utilisation and even square meter/feet utilisation. These analytics will enable managers to identify in which areas the flow of people can be optimised. Areas where utilisation is very low can be repurposed in order to create more value for every square metre in the building. This means that healthcare facilities will be able to provide more on a smaller footprint and at the same time create a better user experience. There are a number of available solutions that could enable digitalisation of facilities. In order to leverage available data and technologies, it is essential to have a core building infrastructure that integrates the different systems into one platform and aggregates the data to enable analytics that provide the right insights and actions at the right time. This integrated infrastructure is more cost-efficient and provides the flexibility to accommodate the changing needs of the facility. Having a holistic approach to digitalisation that brings these systems and data together in order to maximise the value of the data ultimately results in the creation of a smart hospital. * Patient-friendly hospital environments: exploring the patients’ perspective, University of Salford (UK), 2003.